Compartment Equipment Storage: Flexible, smart storage solutions for housing your equipment in exterior compartments can be challenging and ever changing. We offer many customized compartment designs with ergonomics and safety in mind. 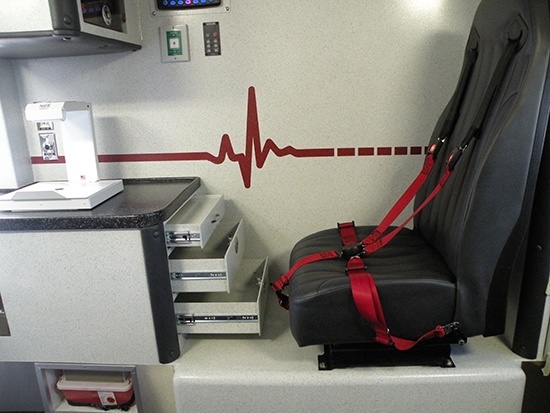 Chevron Striping: Ambulance safety is very important in today’s departments across the nation, the addition of chevron striping on the back of the ambulance module and door interiors helps to increase recognition of emergency vehicles. Drawers: This layout includes custom drawer sizes and a slide out laptop work station. Custom storage options are available to match the customer's specific needs.